Guyana would be lobbying United States (US) stakeholders to support renewable energy initiatives in this South American country as part of its green initiative, President David Granger announced Saturday. Addressing the commissioning of Eureka Medical Laboratories’ (EML) fully-solar powered building on Thomas Street, Georgetown; he said he would be taking his lobby to the US-Caribbean-Central American Energy Summit in Washington DC. “I hope to advance discussions with officials and private sector parties on securing the necessary financing and technologies to help Guyana to tap into the unquestionable renewable energy sources,” he said. Guyana’s annual fossil fuel bill is estimated at US$200 million. The US State Department says Vice President Joe Biden will host the Summit on May 3 and 4 in Washington, D.C. Building on the work of the Caribbean Energy Security Summit that the Vice President hosted in January 2015, the Summit will launch the results of the energy task force for the Caribbean and Central America announced by President Obama last spring, and identify steps that the United States and regional leaders can take to ensure that citizens of these regions achieve a more secure, affordable, and clean energy future. 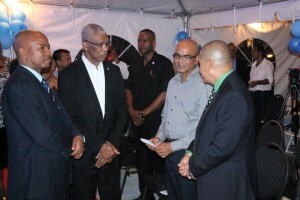 Granger expressed confidence that Guyana could fulfill its pledge in the Paris Agreement on Climate Change that he signed on April 22, 2016 to satisfy all of its energy needs from non-fossil fuel sources. “I am confident that Guyana can satisfy all of its energy needs from renewable sources,” he said. The Guyanese leader noted that the radiation levels are sufficiently high to promote the development of “massive solar farms” in addition to hydro-power from more than 100 sites, biomass cooking gas and wind energy. 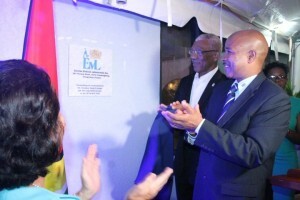 President David Granger and CEO of Eureka Medical Laboratories, Andrew Boyle at the unveiling of a plaque to mark the commissioning of the lab’s newly-constructed solar powered wing on Thomas, Street, Georgetown. Pointing to EML’s’ solar-powered building, he highlighted the importance of not only the public sector but also the private sector in pushing the green energy agenda. “EML has shown that it is possible to fully power its laboratory from solar power and this is a directive that I have given to our ministries, particularly the one with hospitals throughout the country,” he said. Representing the Ministry of Natural Resources, Dr. David Singh said Guyana would be unable to achieve its renewable energy targets without the support of the private sector and domestic financial markets. “I believe that here, today, we are witnessing one of the wonderful examples of how the private sector can respond and do so effectively. We need responsible citizens and good corporate partners to be able to meet our own goals for a green economy,” he said in reference to the EML solar-powered building. EML Chief Executive Officer, Andrew Boyle told the commissioning ceremony that the use of solar power would guarantee a high quality of service by his enterprise that was established on March 5, 1995.
building on Thomas Street, Georgetown. Boyle announced that he has submitted a proposal to the Guyana government to help promote laboratory science as a tool in the country’s health care services by offering timely, relevant and quality laboratory results. “This new form of energy is expected to increase our savings and protect our sensitive electrical equipment and it is expected that with the addition of these new facilities, we will be better able to deliver a higher standard of service to our clients,” said Boyle, a microbiologist. EML, which has partnerships with laboratories in the US and Canada, is certified and is Guyana’s first internationally accredited medical laboratory having met all the ISO 15189 standards. 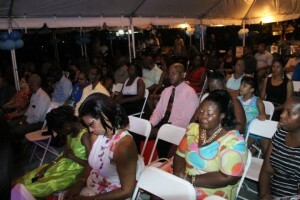 Eureka also has a branch in St. Vincent.